If interest rates go down, then I will buy a house. If I buy a house, I will need a loan. Therefore, I will not need a loan if I do not buy a house. "I will not need a loan if I do not buy a house" is the same as "If I do not buy a house, then I will not need a loan". This is not implied by "If I buy a house, I will need a loan". R: "Interest rates go down." B: "I will buy a house." L: "I will need a loan." If R then B. 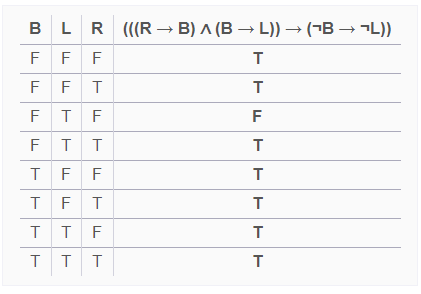 If B then L. Therefore, if not B then not L.
Note the "F" in the third line of the table. This is a line where the premises are true but the conclusion false. Therefore the argument is invalid. The last statement suggests that buying a house is the only reason you would need a loan. Not buying a house does not rule out other reasons for needing a loan. Therefore it's logically false. If it were explicitly stated that you would only ever need a loan when buying a house, it would be logically correct, even though it would be potentially false in reality. YoupT is a new contributor to this site. Take care in asking for clarification, commenting, and answering. Check out our Code of Conduct. All the upvoted arguments are valid. Here's just another way of phrasing the answer. You can drop the first one entirely. Now you're asking : "Logically, are the following two statements equivalent?" No. They're not logically equivalent. The logic concept that you SEEM to want to apply here would be Contraposition (cf. Wikipedia), but it's not applied correctly. How is “~A. Therefore A -> B” a valid argument?